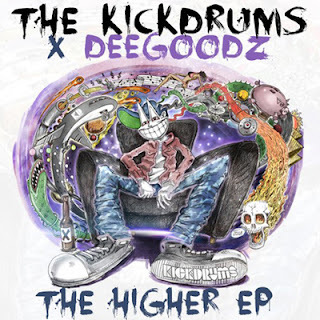 The Kickdrums unveiled a free download of their collaborative EP with rapper Dee Goodz called The Higher EP today. We first got a taste of the project a few weeks back, but now Brooklyn-based producer/songwriter/musical jack-of-all trades Alex Fitts and the Tennessee emcee Dee Goodz let us have all these dope and creative tracks free of charge, which is a great way to bring 2012 to a close. The production, vocals, and rapping are all on point and you can hear the growth of these guys. Looking forward to hearing more from the pair, but for now stream and download below.